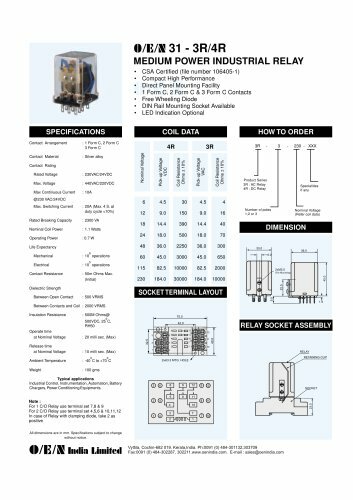 31 - 3R/4R MEDIUM POWER INDUSTRIAL RELAY • • • • • • • CSA Certified (file number 106405-1) Compact High Performance Direct Panel Mounting Facility 1 Form C, 2 Form C & 3 Form C Contacts Free Wheeling Diode DIN Rail Mounting Socket Available LED Indication Optional COIL DATA : 1 Form C, 2 Form C 3 Form C Rated Breaking Capacity Nominal Coil Power Product Series 3R : AC Relay 4R : DC Relay Dielectric Strength SOCKET TERMINAL LAYOUT Between Open Contact Nominal Voltage (Refer coil data) Contact Resistance Operating Power Rated Voltage Coil Resistance Ohms ± 10% Contact Rating Coil Resistance Ohms ± 10% : Silver alloy Contact Material Contact Arrangement Between Contacts and Coil : 2000 VRMS : 500M Ohms@ Release time at Nominal Voltage RELAY SOCKET ASSEMBLY Operate time at Nominal Voltage RELAY RETAINING CLIP Typical applications Industrial Control, Instrumentation, Automation, Battery Chargers, Power Conditioning Equipments. Note : For 1 C/O Relay use terminal set 7,8 & 9 For 2 C/O Relay use terminal set 4,5,6 & 10,11,12 In case of Relay with clamping diode, take 2 as positive Ambient Temperature Insulation Resistance All dimensions are in mm. Specifications subject to change without notice.